Hi this is Kyle speaking for the group today. 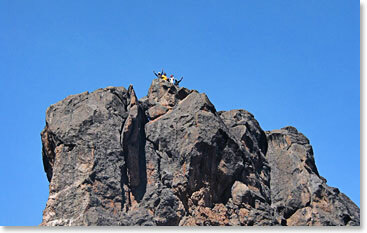 After we arrived at the Lava Tower yesterday, we got a chance to climb the lava rock. The fog cleared out and we were able to see nice views of Kilimanjaro. 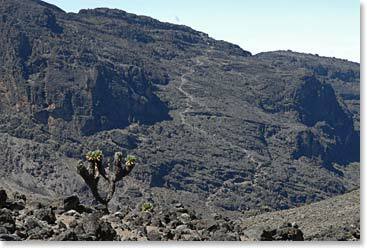 Today, we woke up early and climbed the Barranco Wall before descending through the Karanga Valley. The lower elevation tonight versus last night is welcomed. Everyone is feeling good and in great spirits. 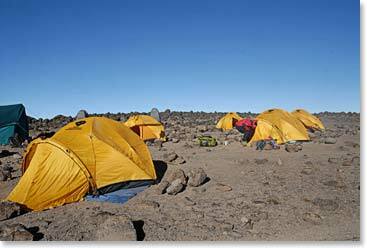 We are finished for the day and are at the Karanga Valley camp at just over 13,000ft/3,960m. It was a bit overcast today and we are hoping it will clear up. Tomorrow is another climbing day up to just under 16,000ft/4,875m at Kossovo Camp. To our friends and family back home, we love you all. Our guides Eric and Julius are taking great care of us. We will talk to you all soon!